Fractures of the distal radius represent a quarter of all fractures seen clinically. 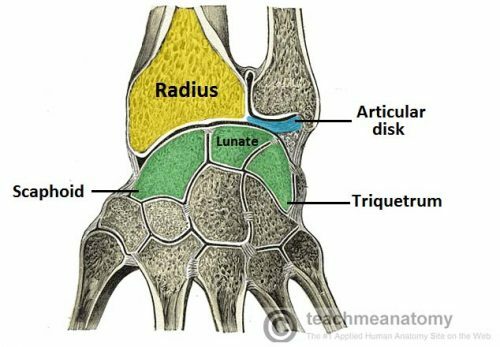 They are fractures occurring through the distal metaphysis of the radius, with or without articular surface involvement. The correct diagnosis and management of these fractures is crucial, as incorrect management may result in loss of normal wrist function, with significant implications on functional status and quality of life. This article will name and focus on the three most common eponymous distal radius fracture types, the Colles’ fracture, the Smith’s fracture, and the Barton’s fracture. The Colles’ fractures is the most common type of wrist fracture, accounting for 90% of all distal radius fractures. Distal radius fractures are most commonly caused by a fall on an outstretched hand (FOOSH). Due to osteoporosis, the risk of these fractures increases with age (termed ‘fragility fractures’). However, children between 5-15yrs are also prone to these fractures. The distal radius takes 80% of the axial load underneath the scaphoid and lunate fossae. A FOOSH causes a forced extension or flexion of the carpus; this in turn increases the impaction load of the distal radius. A Colles’ fracture describes an extra-articular fracture of the distal radius with dorsal angulation and dorsal displacement, within 2cm of the articular surface. By definition, a Colles’ fracture also includes an avulsion fracture of the ulnar styloid. However, this feature may not always be present in those described as such. 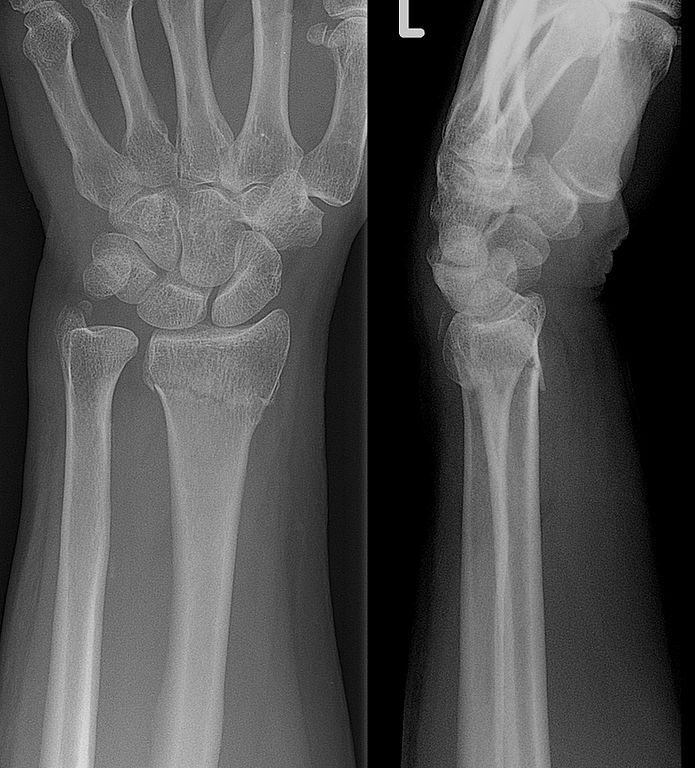 This type of fracture typically occurs due to a fragility fracture in osteoporotic bone, with the wrist dorsiflexed (Fig. 2A). This describes the volar angulation of the distal fragment of an extra-articular fracture of the distal radius (the reverse of a Colles fracture), with or without volar displacement. 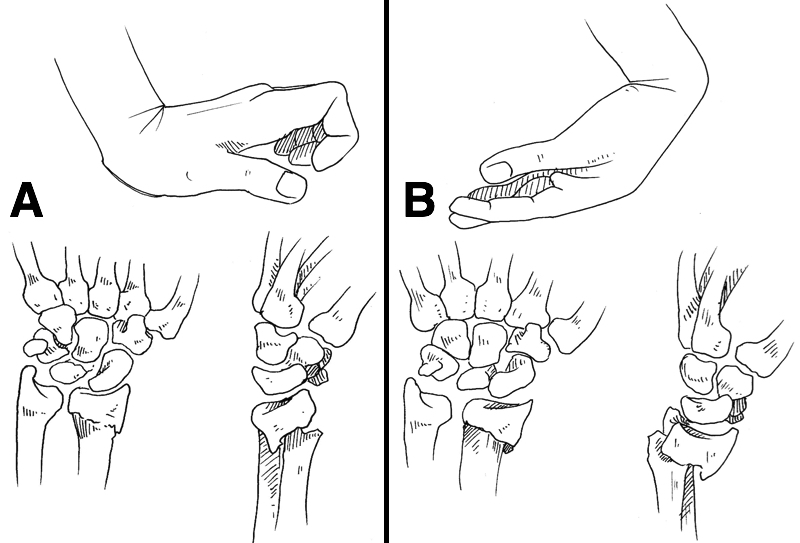 This type of fracture is caused by landing on the dorsal surface of the wrist and are much less common (Fig. 2B). This is an intra-articular fracture of the distal radius with associated dislocation of the radio-carpal joint. A Barton fracture can be described as volar (more common) or dorsal (less common), depending on whether the volar or dorsal rim of the radius is involved. Patients with a distal radius fracture typically present following an episode of trauma, complaining of immediate pain +/- deformity and sudden swelling around the fracture site. Any neurological involvement can also result in paresthesia or weakness. On examination, it is important to assess for any evidence of neurovascular compromise; check nerve function (see below) and limb perfusion (capillary refill time and pulses). Additionally, remember to examine the joints above and below to identify occult injuries. CT or MRI imaging may be used in more complex distal radius fractures, particularly for operative planning, however this can be performed once initial management steps have been made. As for any trauma case (beyond the scope of this article), suitable resuscitate and stabilisation of the patient is the priority. Once stabilised, all displaced fractures require closed reduction in the emergency department. Various techniques can be employed, however all involve ensuring sufficient traction and manipulation under anaesthetic. This can be performed under conscious sedation with a haematoma block or Bier’s block. Once sufficient bone healing has occurred, patients should be rehabilitated via physiotherapy to ensure the regaining of full function.